Hello, my name is Erlina (which is my in-game name too) I play on server Telescopium(420) on the GTA mini client. 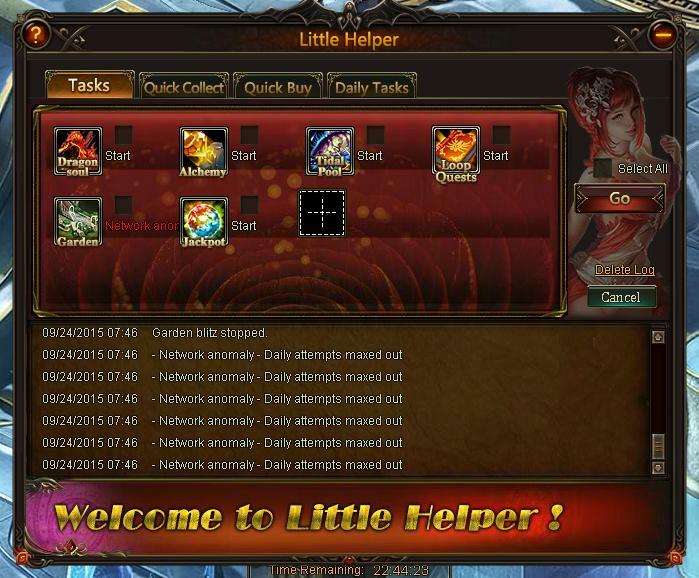 I have noticed that after the recent update of 9-24-2015 the Little Helper will no longer run Raiders or Garden unless there are attempts left. In Raiders IT will no longer synth or collect the chests which become available after the attempts have been done. This makes Raiders very difficult to play. In Garden,IT will no longer collect the planted seeds when they have matured, nor will IT plant new seeds. This makes using the Garden feature pointless. Who has the time to sit and watch this game every hour of the day; just to collect their plantings? I was able to capture a screen print of the Garden problem. I\'m sorry , I do not have a screen print of the Raiders issue, but it is pretty much the same situation. Please let me know at your earliest convenience how or when this problem will be corrected. This update came in the middle of a massive CS Tycoon. I don\'t even expect to rank at this point. WE WANT OLD HELPER BACK! It has been 4 days since I submitted this help ticket. Is there any update please? This is currently known issue, it have been reported already and so far there is no update. 2019-4-21 14:56 GMT+8 , Processed in 0.046999 second(s), 42 queries .